From the moment you enter their First Class cabin, you will know that you are about to experience something unique. Quite simply, they offer the finest First Class environment available, complemented by service straight from the heart. The cabin’s private entrance leads you straight to a world of quiet sophistication, a mood that is enhanced by space. New Business Class makes flying a pleasure. Relax in a comfortable seat with massage function and easy access to the aisle. There’s mood lighting to enhance your flying experience and when it’s time to sleep, simply press a button to turn your seat into a perfectly flat bed for a wonderful night’s rest. Enjoy access to Cathay Pacific’s exclusive lounges when you fly in Business or First Class. Can I bring a guest to the lounge? Customers travelling First Class are allowed to bring a guest to the Cathay Lounge. For Business Class travellers, guests are not allowed, unless you are a member of either the; Marco Polo Club (with a Gold or Diamond status) or OneWorld (with an Emerald or Sapphire status). For more information regarding Cathay Pacific’s baggage allowance, please contact one of our Travel Specialists or check here. Founded in 1946, Hong Kong based Cathay Pacific Airways is one of the world’s leading airlines. Every year, Cathay Pacific’s exceptional service, modern fleet and exceptional safety record are recognised for their outstanding quality. With over 70 flights a week from Sydney, Melbourne, Brisbane, Adelaide, Cairns and Perth, Cathay Pacific serves over 170 destinations in 42 countries and territories, with excellent connections over the Hong Kong hub to the airlines’, worldwide network. Winner of the Skytrax 2012 award for World’s Best Business Class, Cathay Pacific’s new Business Class offers the perfect balance between privacy and openness, truly setting the benchmark for Business Class travel. 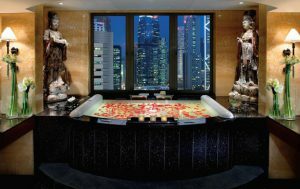 The Landmark Mandarin Oriental is simply one of the best luxury city hotels in the world. 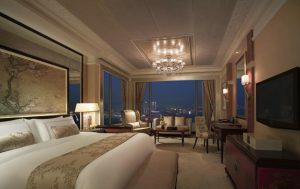 Their 113 guestrooms are amongst the largest hotel rooms in Hong Kong and each a masterpiece of contemporary design. This iconic Hotel is one of the finest in the world. 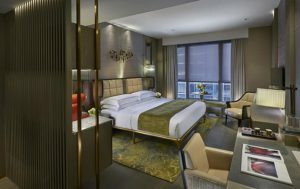 Offering the most spacious hotel rooms and suites in Hong Kong, recent changes have launched it to the very forefront of international luxury, ushering in a new spirit of hospitality. Located overlooking the glittering Victoria Harbour, our hotel has been the centre of Hong Kong’s social and business scene since 1963. Following our recent redesign and through constant attention to detail, we offer the finest in 21st century luxury for travellers. With a reputation that continues to endure with legendary service. 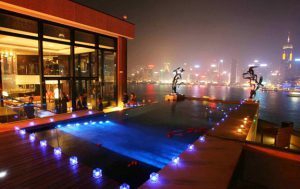 The hotel’s stunning Presidential Suite is one of the most spectacular in Asia and the largest in Hong Kong at 7,000 square feet with a 2,500 square feet terrace with infinity swimming pool overlooking Victoria Harbour and Hong Kong Island. 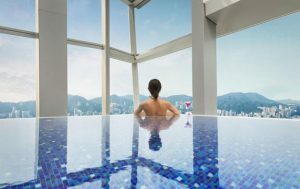 Located above Pacific Place shopping complex, in Hong Kong’s Central district, Island Shangri-La offers luxurious rooms with free internet access, a 24- hour fitness centre and Michelin star restaurants. 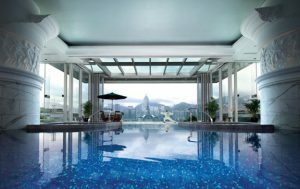 The Ritz-Carlton, Hong Kong makes a magnificent return to the city with the world’s tallest hotel. Book online tours and sightseeing in Hong Kong. For NYE firework or fine dining with fantastic view, go Aqua Tokyo 29th floor, Italian and Japanese food. Lying at the southeastern tip of China, Hong Kong adjoins the province of Guangdong (Canton), and is just south of the tropic of Cancer. The total land area of Hong Kong is 1,078 square kilometers, comprising Hong Kong Island (77.5 square kilometers); Kowloon (45.5 square kilometer); and the New Territories, including 235 outlying islands (955 square kilometers). Today Hong Kong has become a great international trading post, a powerful manufacturing base and one of the world’s largest financial centres. The population as of 2002 was about 7.5 millions, almost 95 per cent of which is Chinese. Chinese and English are the official languages. Cantonese is the most widely spoken Chinese dialect, though Mandarin, Shanghainese and other Chinese dialects are also spoken. Many people, especially in shops, hotels, and service industries, speak English. Summer (late May – mid-September): Hot and humid. Temperature may rise to 33°C (91 °F) with humidity up to around 90%. . Shirtsleeves, cotton clothing, a sweater for indoors and an umbrella for outside suggested Average temperature: 28°C (82°F), humidity 80%, sea temperature 28°C (82°F). Autumn (late September – early December): temperature and humidity drop. Clear sunny days. Shirtsleeves to sweaters and light jackets suggested. Average temperature: 23°C (73°F), humidity 72%, sea temperature 17°C (63°F). Winter (late December- February): Cool with low humidity. Suits, light woollens and sometimes overcoats suggested. Average temperature: 17°C (62°F), humidity 72%, sea temperature 17°C (63°F). Visitors must hold a valid passport, endorsed where necessary for Hong Kong. Citizens of some 24 countries, including the USA, Japan, and certain Western European and South American nations are permitted one-month visa-free visits. Three-month visa-free visits are available to another 23 countries as well as all Commonwealth countries. Visitors from most countries can enter Hong Kong without a visa for periods of seven days to six months, depending on nationality. Check with any Chinese embassy or consulate for the latest status. Vaccination certificates are not required for yellow fever, cholera and typhoid for visitors travelling to Hong Kong. Check with your travel agent well before your departure, however, as requirements can change without notice. Liquor – A one-litre bottle of wine or spirits. Ivory – The importation and exportation of raw or worked ivory is governed by strict regulation. Firearms must be declared and handed into custody until departure. A baggage storage service is available in the departure hall and the arrival hall. Other services include a bank, moneychangers, gift shops, duty-free shops, snack bars, restaurants, payphones, a police station, post office, a HK Telecom International Ltd. Office, HKTA Information Centres and private reception rooms. Adults: HK$80; children (aged 12 years and under) free. Hong Kong is generally considered a safe city by day or night. Policemen are very helpful, and those who speak English wear a red label under their shoulder badge. As in all big cities, avoid carrying large amounts of cash; traveller’s cheques or credit cards are preferable. Make use of your hotel’s safe-deposit boxes. The unit of currency is the Hong Kong dollar (HK$). Notes issued by two private banks (the Hongkong and Shanghai Bank and Standard Chartered Bank) have denominations of $10, $20, $50, $100, $500, and $1000. The Bank of China issues all of the denominations except HK$10. There are silver coins for HK$1, HK$2, and HK$5, bronze coins for HK10 cents, HK20 cents and HK50 cents, and a new nickel and bronze coin for $10. Most foreign currencies and traveller’s cheques are easily changed in Hong Kong, either at banks, hotels or moneychangers (check how much you will get in return before handing over your money). Most restaurants add a 10 per cent service charge but an additional 5 per cent may be given, where deserved. When a service charge is not automatic, 10 per cent is acceptable. Small tips may also be given to taxi drivers, bellboys, doormen and washroom attendants. The voltage in Hong Kong is 200/220 volts, 50 cycles. Most hotels provide adaptors. All water direct from government mains in Hong Kong satisfies the United Nations World Health Organization standards. Bottled water is widely available in hotels and supermarkets. Telephones in Hong Kong are advanced, economical and easy to use. Local calls are free, and many stores and restaurants offer use of a telephone free of charge to patrons. Calls from public coin phones cost HK$1. Most hotels have International Direct Dialling (IDD). Please note that some hotels charge a handling fee for local and/or international calls. You can also make long-distance calls from (IDD) Public Coin Phones and from HK Telecom International Ltd. Offices. An easy method of making calls is to purchase stored-value phonecards (HK$50, $150 and $200), which can be used in any Cardphone box. The new Hello Phonecard (HK$100, $200,$300) is a stored value card that enables the user to place calls to and from over 30 countries from a touch-tone phone. Both types of cards can be purchased at HKTA Information and Gift Centres and most convenience stores. Call 013 for information. The main post offices are on Hong Kong Island, next to the Star Ferry and in Kowloon at 10 Middle Road, Tsim Sha Tsui. Both are open from 8am to 6pm, Monday to Friday and 8am to 2pm on Saturday. All post offices close on Sunday and public holidays. There are two English-language channels. Programmes include a selection of locally produced shows as well as features from the UK, the US, and Australia. Also available is STAR TV (a satellite channel) and, in some areas, Cable TV (subscription television). Fifteen radio channels are broadcast in Hong Kong. Six English-language channels provide a wide range of programmes and the BBC World Service is available 24 hours. Most offices open from 9am to 5pm with a lunch hour from 1 pm to 2pm. On Saturday the hours are 9am to 1 pm. Some Chinese businesses open at 10am and close around 6pm or later. Major banks are open from 9am to 4.30pm on weekdays, 9am to 12.30pm on Saturday. After you have reclaimed your baggage and passed through Customs, you will find yourself in the Buffer Hall of Hong Kong International Airport where the Hong Kong Tourist Association Information Centres are located . There you can obtain free visitor publications and any other assistance you may need. Hong Kong International Airport is approximately 40 minutes’ drive by car from all major hotels in Kowloon and about 50 minutes’ drive via the Cross-Harbour Tunnel from all major hotels on Hong Kong Island (under normal traffic conditions). If you are making your own way to your hotel, follow the signs directing you to the Transport Terminus for taxis or use the airport coach service. If you have no local currency on arrival, change only enough at the airport to get you to your hotel. Hotel bookings do not normally include transportation from the airport. However, if you have a prearranged hotel booking that includes an airport transfer, you should leave the Buffer Hall via the exit marked Hotel Transport and look for the hotel representative waiting to meet you. Taxis are numerous and readily available, and fares are low compared with those in most cities. Red taxis serve Hong Kong Island and Kowloon; green ones in the New Territories and blue taxis on Lantau Island operate at even lower rates. Many drivers speak some English but it is wise to have your destination written in Chinese characters. Taxi drivers expect a tip, but just round up the fare to the nearest dollar. Drivers cannot pick up or drop off passengers on restricted streets, which are marked with yellow lines. New Territories taxis will pick up and drop off only in the New Territories. If you have any queries or complaints, note the taxi’s number and call the 24-hour Police Hotline on 2527 7177. Double-decker buses, which run from 6 AM till 3 midnight, cover most parts of the territory. Fares range from HK$1 to HK$30.60. Exact change is required. You’ll find that, in general the drivers do not speak much English. Minibuses are small passenger vans which are yellow with a red stripe. They can pick up passengers and let them off anywhere except regular bus stops and the usual restricted areas. Fares range from HK$2 to HK$7. Maxicabs are yellow with a green stripe. They run along specific routes and have fixed prices ranging from HK$1 to HK$8. A sign on the front indicates the destination. Pay as you get on. The Kowloon-Canton Railway (KCR) is 34 kilometres long and runs from Hung Hom in Kowloon up to the border with China. Trains run every tour to 10 minutes in each direction, and vary according to the ordinary single trip to Sheung Shui, the farthest you can go without a China visa). It’s a go way to visit some of the New Territories’ towns and villages. The Mass Transit Railway (MTR), Hong Kong’s fast, efficient and air-conditioned underground system, runs not only along the north side of Hong Kong Island, but also from Central across the harbour to divide into east and west branches in Kowloon. Stations are located by a X symbol. Fares range from HK$4 to HK$11. MTR and KCR stored-value tickets (HK$70-200) are also available. The Light Rail Transit (LRT) is a high-speed surface system linking the New Territories towns of Tuen Mun Yuen Long. The LRT runs from 5.30am to 12.30am daily. Fares range from HK$3.20 to $4.70. The Star Ferry, which has connected Hong Kong and Kowloon since 1898, runs regularly between 6.30am to 11.30pm. At HK$ 2.20 (upper deck), it must be one of the cheapest and most scenic ferry rides in the world. The crossing takes approximately eight minutes. The Hong Kong Ferry (Holdings) Company provides other regular and inexpensive services which connect Hong Kong Island to other parts of the Kowloon Peninsula and to the outlying islands. Since 1904, the tram system has run east to west along the north side of Hong Kong Island, and still provides a leisurely, grandstand view. The flat fare is HK$1.20 (exact change required) and the service operates between 6 AM and 1 AM. The Peak Tram is one of the most advanced tram systems in the world, taking just eight minutes to climb Victoria Peak. The service operates from 7am to midnight and the single fare is HK$12 (HK$19 return). The funicular railway has run since 1888 and is still the quickest way to reach the Peak. Self-drive rental cars are not often used in Hong Kong, but chauffeur-driven cars are widely available. Hotels have their own limousines for hire. The only means of travel in the old days, rickshaws today are used mainly for fun rides and photo sessions. Rickshaw drivers congregate at the Star Ferry on Hong Kong Island and charge for a trip round the block or for a photo session. Negotiate the price first. NEWS, REVIEWS & GREAT OFFERS! Subscribe to Our Newsletters and Never Miss a Deal! Get the latest offers, reviews and news! © 2019 Firstclass.com.au. All Rights Reserved.